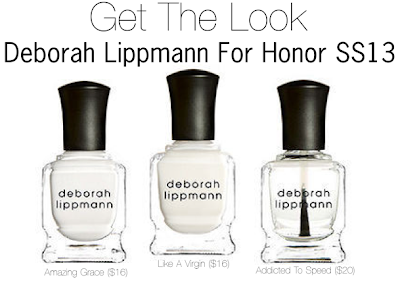 Now that Spring 2013 Fashion Week has kicked off without a hitch, it's the perfect time to start scouting next season's beauty trends, and since I got to catch up with Deborah Lippmann backstage at Honor's SS13 show I officially got geared up to to talk about all things nails. For Honor's presentation Deborah wanted to incorporate a clean yet edgy nail to go with the bold, (human) anatomy inspired collection. Bringing the perfectly groomed white nails to be the 'bone' of the look, she wanted to finish them off with a high gloss shine using the Addicted To Speed Top Coat. 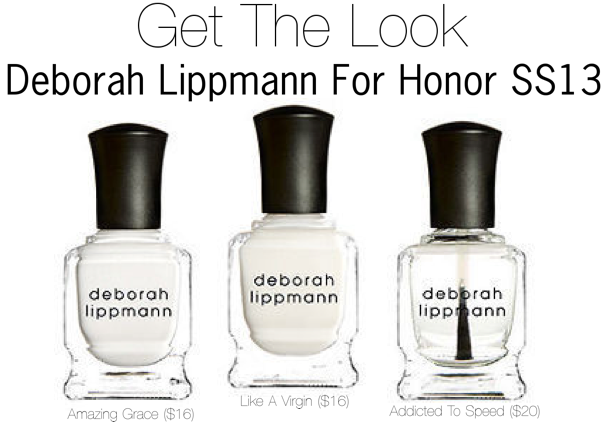 To achieve the creme like shade, Deborah paired the opaque white creme, Amazing Grace with a sheer bright white polish, Like A Virgin giving some depth to Honor's colorful and uniquely printed dresses and separates. And of course, to keep things consistent she repeated the high gloss, clean white look on the model's toes. I'm going to go on a limb and say white is going to be back for Spring 2013, but don't fret, Deborah said nail art is still in, so get creative ladies and show your personality. After all, according to Deborah, nails effect mood and personality. Who knew?! White might actually be the one color that I don't wear on my nails. Look like I might be trying it out come spring! I wore white nails this past spring/summer and I liked it so i'm sure i'll be doing it again next spring/summer. Won't be Deborah Lippmann polish though. @_@ Pricy! I haven't painted my nails white in a long time.